Number one for ease of operation and ergonomics: The eye level control panel of the Altendorf WA 8 X can be pivoted to the most convenient position for the operator. The rip fence is motorised. 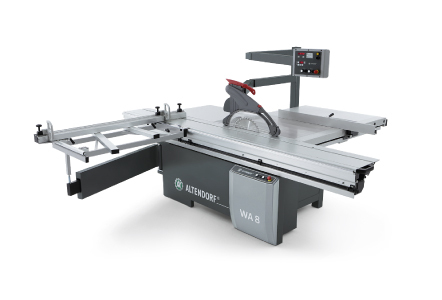 The Altendorf WA 8 is not available in all markets. The standard equipment of the machine may vary from country to country. Motorised rise/fall and tilt adjustment. All major control functions are always visible. The panel pivots into the most convenient position and is accessible from both sides of the machine. Adjustment of both the saw blade and the rip fence are motorised. The Altendorf sliding table is renowned for its smooth and exact running. This is hallmark of an Altendorf, and it all comes down to design: the table runs on large dumb bell rollers sandwiched between hard chromed guide bars, guaranteeing absolute precision. The system’s large rollers ensure smooth action, meaning the table takes less effort to move and glides as securely as if it were on rails. 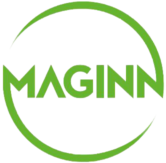 This quality running will endure decades of heavy load bearing in the constant presence of dust and chips, and it needs virtually no maintenance. Each time the table moves, the brush fitted to the upper part automatically cleans the round guide bars. The system operates without any lubrication. The table’s hollow multi-chamber aluminium extrusion guarantees optimal torsion resistance and rigidity. The motorised rip fence has a traverse speed of 250 mm/sec. and an accuracy of +/− 1/10 mm. The high precision five-point recirculating ball spindle system needs little maintenance and, along with the motor, is well protected by its integration into the aluminium profile. The fence automatically recognizes the position it’s in, especially when it reaches the danger area around the saw blade. It has an emergency cut-out to prevent the risk of crushing. The robustly mounted crosscut fence enables precise cutting of 90° angles. All settings are easy to read off the slanted scales. The flip stops are robust, free of play and are easy to slide individually along the full crosscutting range. The large Altendorf extraction and safety hood system boasts a design which ensures optimised airflow. You can switch between narrow and wide hoods in seconds. The hood allows cutting heights of up to 125 mm (with or without scoring unit) and can be swung away fully to one side. This hood is available as an option for the WA 8 NT and WA 8 T.
The WA 8 has a torsion-resistant machine frame built in the same way as the machine frames for the F 45 series. The frame design ensures very smooth running and stability. The machine frame is fully enclosed. The Altendorf saw unit is the engineering heart of all our saws. It is a powerhouse produced with the latest manufacturing technology. The saw shaft runs incredibly smoothly: this is because it is electronically balanced as a fully assembled unit, and extensive use is made of cast components. The high-precision vertical movement of the unit is linear with maintenance-free guide bearings. The robust tilt quadrants incorporate the traditional Altendorf tongue and groove connection system, which allows the whole unit to tilt easily and precisely to exactly the correct angle.